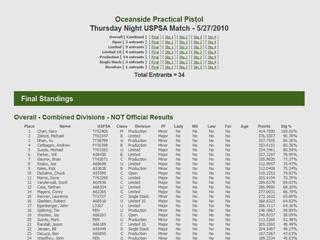 This project grew out of a desire to have an easy, reasonably automated method for posting local club USPSA match scores on the Oceanside Practical Pistol website. Practiscore is the most common way of scoring a USPSA match as it is free to member clubs and its output is required if you want to electronically upload classifier scores. As it turns out, the webfile.txt file produced by Practiscore has all of the match data and is already in a comma-separated-values like format that makes it relatively easy for a web scripting language like PHP to parse. Automated generation of the entire score sheet directly from webfile.txt (which is produced by Practiscore and, previously, EzWinScore). If a classifier is present a link is included directly to the classifier COF and, optionally, calc buttons provide each shooter with a direct link to an estimate of their classifier national percentage. A popup provides scoring detail (number of As, Bs, misses, etc.) when the user hovers their cursor over the points or penalties columns in a stage. Shooter USPSA numbers are linked directly to that shooters classifier lookup page at uspsa.org. Cascading Style Sheets for formatting to match the club's website without having to change the underlying PHP code. The ability to easily “include” into a score sheet custom header and footer html, useful for things like scoring explanations at the bottom of a score sheet. Score sheets pages can feature a simple URL, making it easy to link directly to the score sheet or send a link in an email. Tested with Practiscore and versions 3.X and 4.0 of EzWinScore. Scoresheets scale nicely on small devices (e.g. smartphones). The USPSA Scoring package is free for use by any and all USPSA clubs, and comes without any warranty. This software has not been certified by USPSA and should not be used for official results from sanctioned matches. I'm more than willing to try and answer questions or take suggestions for enhancements via email, contact me at brian@oceansidepistol.com. Web hosting that include support for the PHP scripting language. PHP is very commonly supported, but not universally so. Most Unix and Unix derivative (i.e. Linux) hosts support PHP, as do more and more Windows based hosts. Check with your hosting provider if you're not sure. Some knowledge of web scripting languages, ideally PHP. The package should be fairly complete and ready to run, but you still may need to roll up your sleeves. Knowledge of cascading style sheets. The package uses CSS for all of its formatting (ideally users should not have to modify the core code). The current release is version 1.5.1 and a zip containing the PHP source and instructions is available here: uspsa_scoring_151.zip. Practiscore support was added to this release.